Attorney General Eric Holder during an interview with the Associated Press at the Justice Department in Washington on Sept. 16. Eric Holder is reportedly stepping down as attorney general. We don’t yet know whom President Obama will nominate to replace him. But whoever is picked is likely to face at least a moderately tough confirmation hearing in the Senate. Although the vast majority of Cabinet nominees are confirmed, the confirmation of an attorney general has been the most contentious of any Cabinet position. Here are the average and median number of “no” votes during confirmation for each of the 15 Cabinet positions since 1977. For voice votes and unanimously confirmed votes — signs there is virtually no opposition to a nominee — the “no” votes are equal to zero. Attorney general nominees are by far the most likely to face serious resistance. The average number of “no” votes for all Cabinet position is just 4.5. AG nominees average 13 more than that — 17.4 “no” votes — far ahead of labor secretary nominees at No. 2, who have averaged 10.3 votes. A lot of these averages, though, are skewed by one or two confirmation votes in which the nominee was particularly controversial. 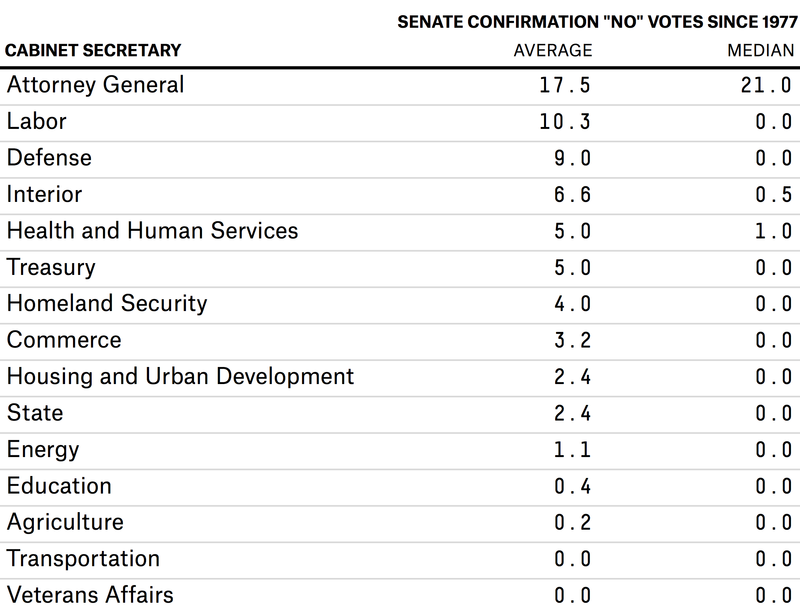 For example, defense secretary nominees would average half as many “no” votes if we didn’t count John Tower’s 1989 confirmation — 53 senators opposed him. That’s why the median column is quite instructive. 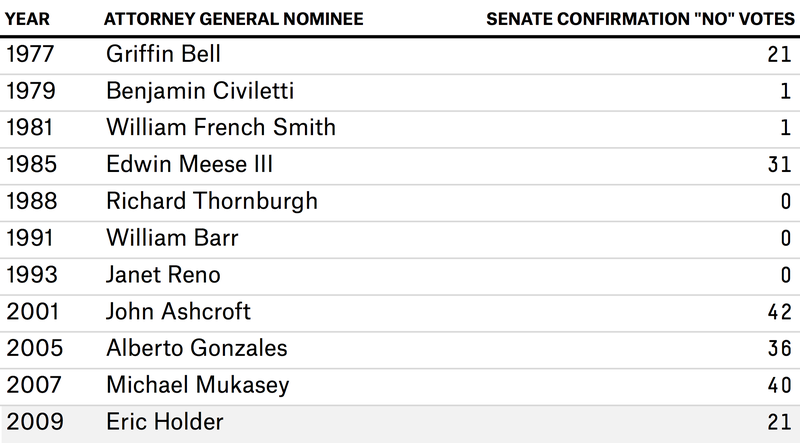 The median attorney general nominee received 21 “no” votes. That is, the majority of AG nominees since 1977 have faced combative hearings. Most nominees outside of attorney general glide through the Senate. No other position has a median number of “no” votes greater than one. In fact, most have a median of zero. And most of the truly contentious Senate confirmation votes for attorney general have come in the past 15 years. From the Carter to the Clinton administrations, there were only two AG confirmation votes (Griffin Bell and Edwin Meese III) in which the nominee received more than one “no” vote. Since then, it’s been a different ballgame. Holder, with just 21 senators opposing him in 2009, was the most easily confirmed attorney general in the past 15 years. Of course, Holder was confirmed during Obama’s honeymoon period, a time when nominees tend to more easily slip through the Senate. But now, Republicans are as angry with Obama as ever. History suggests they are likely to take out some of that anger by ensuring that his AG nominee faces rough questioning. Additionally, Holder benefitted from the Democratic majority at the time of his confirmation, in 2009. The party had 59 Senate seats. The other AG nominations took place when the president’s party had a smaller majority — or even a minority in the case of Michael Mukasey. We don’t know how quickly Obama will name Holder’s successor or how soon the Senate will vote. President George W. Bush nominated Mukasey in mid-September 2007, and Mukasey was confirmed by early November. When Obama’s new AG nominee faces a vote, Democrats are likely to hold a slight majority or be in the minority. That may be why Holder announced his resignation now; with a possible Republican majority in 2015, the next Congress might have the potential for more “no’s” than the current one. But let’s not get carried away: Remember, most AG nominees are confirmed. But they’re confirmed with more difficulty than nominees for other Cabinet positions.